Z.Z. HILL-THE BRAND NEW Z.Z. HILL. The story behind how Z.Z. Hill found himself in Muscle Shoals, Alabama, recording with producer Swamp Dogg is the equivalent to a game of musical pass the parcel. It all started when Swamp Dogg bought Z.Z. Hill’s contract from Quin Ivy, one of the stalwarts of the Muscle Shoals music scene. There wasn’t much Quin hadn’t done. He’d been a DJ, songwriter, owned a record shop and opened the Quinvy Studios. Quin had also produced Percy Sledge, but wouldn’t be producing Z.Z. Hill. No. The pair didn’t get on. There was a good reason for this though. Quin had been tricked into buying Z.Z. Hill’s contract from Phil Walden, who’d managed Otis Redding and founded Canyon Records. Phil Walden was another music industry veteran. He’d managed and founded Capricorn Records. It was to Capricorn Records that Z.Z. Hill was signed. Z.Z. Hill and Phil didn’t see eye-to-eye. However, when Phil sold the contract to Quin, it was like jumping from the frying pan into the fire. Now his contract had changed hands again. Swamp Dogg owned the contract. There was a problem though. Z.Z. Hill was avoiding Swamp Dogg. The only way to contact Z.Z. Hill was through his brother Matt. There was a reason for this. Whilst under contract to Quin, Z.Z. Hill had recorded Don’t Me Pay For His Mistakes. It had been a huge hit. As Swamp Dogg owned the contract, he was entitled to a royalty. That’s why Z.Z. Hill was avoiding Swamp Dogg. Eventually, when the pair met Swamp Dogg agreed to forego any royalties. He also paid Z.Z. Hill $5,000 and a small royalty to record what became The Brand New Z.Z. Hill, which was recently released by Alive Records. Ironically, Swamp Dogg had chosen Quinvy Studios to record The Brand New Z.Z. Hill. Surely, that was a step to far for Z.Z. Hill? It wasn’t. Z.Z. Hill agreed to record the blues opera that was The Brand New Z.Z. Hill, at Quinvy Studios. Most of the songs were written by Swamp Dogg and one of his regular songwriting partners Gary US Bonds. A total of ten tracks were recorded by Z.Z. Hill at Quinvy Studios. Accompanying Z.Z. Hill were some of the best musicians in Muscle Shoals. When recording of The Brand New Z.Z. Hill began, Swamp Dogg had put together a crack band of musicians. The rhythm section included Bobb Wray, Butch Owens and Charles Haywood, while Jesse Carr and Jimmy Evans played guitar plus drummers Fred Proudy, Jasper Guarino and Lou Mullenix. Chuck Levell, Clayton Ivy, Ronnie Oldham and Swamp Dogg played piano and organ. Trumpeter Gene “Bowlegs” Miller was part of the horn section on The Brand New Z.Z Hill. Swamp Dogg produced eight tracks and Quin Ivy two tracks. These ten tracks became The Brand New Z.Z Hill. 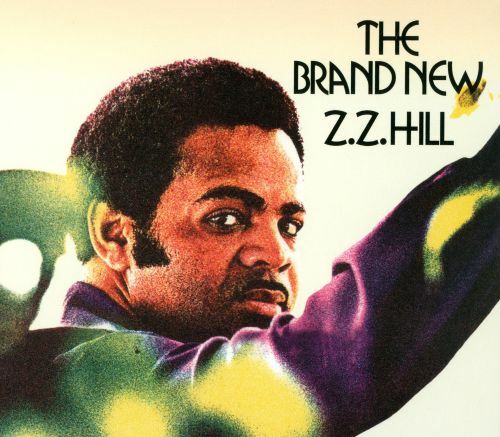 On its release in 1971, The Brand New Z.Z Hill reached just 194 in the US Billboard 200. Of the singles released from The Brand New Z.Z Hill, Faithful and True reached the US Billboard 100, then Chokin’ Kind reached number fifty in the US Billboard 100. Despite what seems like a commercial failure, Swamp Dogg claims six singles recorded at the The Brand New Z.Z Hill sessions, sold over a million copies. Swamp Dogg and Z.Z Hill were doing something right. You’ll realize what on The Brand New Z.Z Hill. It Ain’t No Use opens The Brand New Z.Z Hill. Waves of drama unfold, as the rhythm section and crystalline, chiming guitars create a shuffling beat. They introduce a half-spoken vocal. It’s no Z.Z. though. No it’s Bob Carl Bailey, a local DJ, who filled in for Z.Z. who only spent three days in the studios. He vamps his way through the lyrics, his vocal sassy, feisty and tinged with humor. Leawill Little plays the female role in this mini soap opera. Then having set the scene, Z.Z. Hill’s unmistakable vocal takes centre-stage. A raspy, throaty vocal, it’s full of emotion and despair, as his relationship has gone wrong. Enveloped by blazing horns and chiming, B.B. King-esque guitars, Z.Z. defiantly sings: “you wanna come back home it’s too late, you’ve done me wrong.” It’s as if this is payback, revenge for the hurt she’s caused. A delicious fusion of blues and Southern Soul, this is indeed The Brand New Z.Z Hill. It’s not the half-spoken vocal from Bob Carl Bailey that grabs your attention as Ha Ha (Laughing Song) unfolds. No. It’s the band’s performance. They’re a tight and talented unit. Seamlessly create a sultry, bluesy backdrop.This comes courtesy of the rhythm section, driving guitars and piano. Then midway through the track Z.Z. makes his entrance. His vocal is full of frustration and anger. Meanwhile horns growl and rasp, as he unleashes a growling, gnarled vamp. He’s almost mocking his partner who he’s come to despise. The dialogue that opens Second Chance, is like eavesdropping on a relationship gone badly wrong. Z.Z. realises that their relationship is over. Despite that his partner begs for a Second Chance. His vocal is wistful and full doubt as he delivers the line: “do you believe you deserve a Second Chance?” It’s like a rhetorical question. Behind him, the arrangement has Southern Soul written all over it. Washes of Hammond organ, piano, stabs of blazing horns and a slow, thoughtful rhythm section provide the perfect backdrop for Z.Z’s soul-searching, melancholy opus. Our Love Is Getting Better is quite unlike the previous tracks. There’s no dialogue. Instead, it bursts into life. Bursts of blazing horns, a powerhouse of a driving rhythm section and piano joins provide the backdrop for Z.Z. He matches the band every step of the way. Power and passion are combined, while dramatic bursts of soaring harmonies are the finishing touch. The result is a swinging fusion of blues and Southern Soul that features Z.Z. at his best. The Chokin’ Kind was one of the singles released from The Brand New ZZ Hill. No wonder. From the opening bars you’re hooked. As Z.Z. delivers a heartfelt, impassioned vocal, the band create a wistful Southern Soul arrangement. It’s ying to Z.Z’s yang. As guitars chime, a bass explores the same groove and horns rasp and growl. A Hammond organ and hissing hi-hats add to the drama and emotion of this heart-wrenching track. Hold Back (One Man At A Time) sees the tempo drop and the arrangement take on an understated sound. That allows Z.Z’s vocal to take centre-stage. As he delivers the lyrics, the band play around him. There’s a mixture of irony and pathos in his vocal. He’s not going to be used, cheated on and then cast aside. No way. That’s obvious from his vocal. Behind him, bursts of braying join with the rhythm section and piano to add bursts of drama. They never overpower Z.Z’s vocal and compliment his vocal which brings meaning and emotion to the lyrics. A Man Needs A Woman (A Woman Needs A Man) is another slower song. Against a slow, melancholy arrangement Z.Z. delivers a needy, soulful vocal. Stabs of braying horns answer his call, while harmonies soar above the arrangement. They’re the perfect accompaniment to Z.Z’s vocal. Equally soulful, they match him for emotion. When they drop out, just the piano and rhythm section accompany Z.Z, before grizzled horns add the finishing touch to what’s one of the best ballads on The Brand New ZZ Hill. Early In The Morning has a real bluesy sound. It’s the rasping horns that lead to this comparison. Then there’s the bursts of chiming, crystalline guitars that remind me of B.B. King. As for the rhythm section, they up the tempo slightly. Z.Z’s vocal is swept along above it. He unleashes a vocal that’s a combination of power and emotion. Vamping his way through the arrangement, chiming guitars and braying horns drive Z.Z. to even greater heights of drama and emotion as he mixes blues and Southern Soul seamlessly and successfully. Just drums opens I Think I’d Do It, which closes The Brand New ZZ Hill. Stabs of horns then usher in Z.Z’s vocal. He struts and vamps his way through the track, unleashing a myriad of hollers and shrieks. His band decide to kick loose. The blazing, braying horns are at the heart of the action. So are the rhythm section and piano, as Z.Z. closes The Brand New ZZ Hill on a bluesy, soulful and dramatic, vampish high. Sadly, The Brand New ZZ Hill wasn’t the commercial success that it deserved to be. It was his third album. Z.Z. had released The Soul Stirring ZZ Hill in 1965, with A Whole Lot Of Soul following in 1969. Two years later came The Brand New ZZ Hill. Ironically, it was the same old story, with Z.Z’s music not finding the audience it deserved. All it needed was the right label behind him. Maybe Mankind, a short-lived and unsuccessful subsidiary of Nashboro was the wrong label for The Brand New ZZ Hill? After all, everything else was in place for The Brand New ZZ Hill to be a commercial success. There was nothing wrong with Swamp Dogg, Gary US Bonds’ and Quin Ivy songs. The same goes for Swamp Dogg and Quin Ivy’s their production skills. Quite the opposite, The Brand New ZZ Hill was an innovative concept album where blues and Southern Soul became one. Accompanied by a crack band of top session players, Z.Z. Hill made the music come alive. Blessed with a voice that can inject emotion, meaning, and energy into a song, lyrics come alive. It only takes one listen to The Brand New ZZ Hill which was recently released by Alive Records and you’ll realise this. Whether its sadness or joy, hurt, heartbreak and happiness Z.Z. Hill can deliver this and more. Love songs, breakup songs and makeup songs Z.Z. delivers them with feeling. However, there’s more to his music than that. He can grab a song by the scruff of its neck, making a good song a great, and an average song good. Not every singer can do this. Z.Z. Hill could and did. Sadly, he never enjoyed the success his talent deserved. No. After The Brand New ZZ Hill, fame made fleeting visits to Z.Z. Hill. He briefly met the seductive temptress that is fame. Like many other singers, he enjoyed a tantalising taste of what fame had to offer. Sadly, although he never experienced its delights to the fullest. Having glimpsed and tasted its delights, tragically, Z.Z. Hill’s career was cut tragically short. Aged just forty-nine, he died in 1984, having recorded eighteen albums. One of the highlights of Z.Z. Hill’s back-catalogue is The Brand New ZZ Hill, the blues opera that could’ve and should’ve transformed his career. Standout Tracks: It Ain’t No Use, Second Chance, Hold Back (One Man At A Time) and A Man Needs A Woman (A Woman Needs A Man).